Disclosure: I was given tickets by GigaSavvy to giveaway for this post. breast cancer awareness, services and research. and limited edition specially designed "pink" merchandise. Did you know that in Orange County, one in eight women will be diagnosed with breast cancer? will be and how I can help get research and services funded to help when it does. and treatments that detect breast cancer in its earliest and most curable stage. for the Cure benefiting Susan G. Komen Orange County. Orange County with life-saving breast health services. theme park admission ONLY ONLINE at www.knotts.com. A portion of the "Pink Tickets" proceeds will benefit Susan G. Komen Orange County. Guests entering the theme park during the time of the promotion will be greeted by a pink Knott’s Berry Farm for the Cure display adorned with Snoopy and his pal Woodstock. special display in honor of, or in memory of, someone affected by breast cancer. 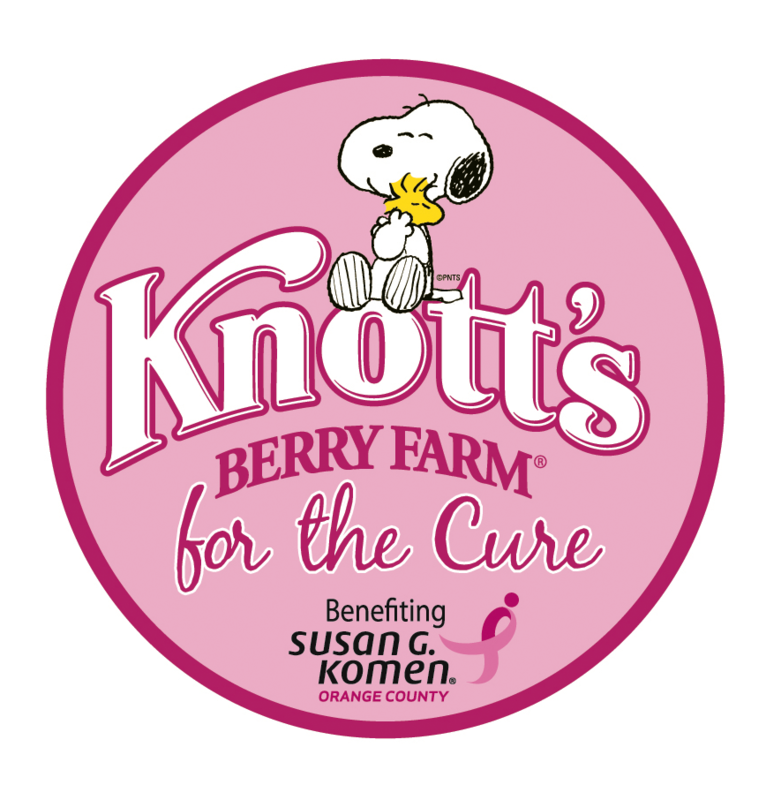 Knott’s Berry Farm and all proceeds will benefit Komen Orange County. I'm giving away 2 tickets to Knott's Berry Farm to celebrate #KnottsPink! A sister-in-law is a survivor. She had it in her early 30's. What a great program! Johns aunt beat breast cancer when her girls were little, so did a family friend in my homeward and my sisters mother in law. My mom was diagnosed with uterine cancer when I was 16 so I have a special place in my heart for those who are fighting cancer. My mom is a breast cancer survivor. She was diagnosed with breast cancer when she was 40 years old and had a mastectomy. There are several cousins on my mom's side of the family who lost their battle to breast cancer and one that is battling right now. Also have a friend of the family that is going through it. Such a horrible disease and women need to be aware and be educated on it. Breast Cancer has struck close to home for me. My MIL had it, and 2 close friends have recently had double mastectomies with chemo following. It's scary stuff. I don't know anyone personally, but have met some amazing survivors! I don't know anyone personally who has been diagnosed, but have met some amazing survivors! They are a strong group of women, and it was wonderful speaking with them. We are so blessed! this disease hasn't affected any of the woman in our family, Praise God for that! Whoops sorry just saw what I am suppose to comment on. YES! My TWO good friend from church just became cancer free this last year (breast cancer) AND a girlfirned from HS. I'm lucky to say that I haven't known anyone with breast cancer thus far, but many friends of friends have been affected. One of my coworkers survived breast cancer twice! My husband's grandma had breast cancer. Cool giveaway. We love Knotts. My Aunt had breast cancer when I was a kid. My Grandfather had colon cancer, but he lived much longer afterwards than the doctors had predicted! My best friend's mother died of breast cancer and my friend was diagnosed with it also, but has been cancer free for many years. I had a co-worker who had breast cancer. It was very scary b/c not only was she young, but she was close in age to me. It was definitely a wake-up call. My grandmother died of breast cancer several years ago. It was very sad and may have been prevented had shehad more frequest checkups. Did you pick a winner yet? ?